The victory of Ms Alexandria Ocasio-Cortez for the progressive part of the New York Democrats has, amongst other things, intensified the possible breakup between the far left and central side of the party of former Presidential candidate Ms Hillary Clinton. 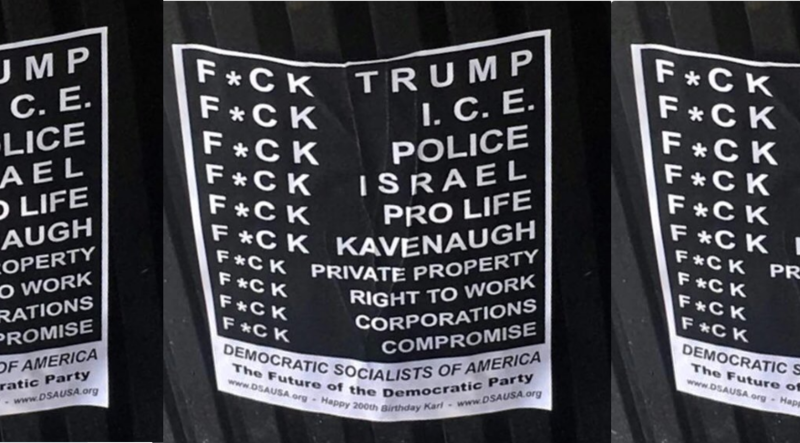 The latest ‘posters’ popping up all over New York city offer advice on what the ‘Democratic Socialists of America’ aim to do should they gain power as ‘the future of the Democratic party’ (to paraphrase Mr Tom Perez, the DNC Chairman) are quite telling of what one may expect. The possible split between the progressive and central part of the Democratic party, an emerging theme which we here at thegoldwater.com have been warning about for several weeks on end, was once again highlighted when earlier this week it emerged that Mr Crowley had not yet offered a concession meeting to Ms Alexandria Ocasio-Cortez and more and more former supporters of Vermont Senator and former Democratic Presidential candidate Bernie Sanders stated they would support the progressive (or in some cases even ‘socialist’) side of their party in the upcoming midterms. This, of course, presents the possible Democratic Presidential contenders of 2020 (Kirsten Gillibrand, Elizabeth Warren and others) with a crucial choice: do they slide to the left and please the younger, more progressive part of their political base, or do they remain dead in the centre and pick up the support of the elder (and often more powerful) politicians who’ve been in power for decades on end. To give you an idea of the advice, the Democratic Socialists in New York aim to abolish private property and corporations, the right to work and compromise. They also clearly do not agree with President Trump’s favored candidate for the Supreme Court but could have at least spelled his name correctly. To put matters into perspective, not only has Representative Joe Crowley refused to show up for a planned concession call with Ms Ocasio-Cortez, the House Minority Leader for the Democrats, Ms Nancy Pelosi put it best when she stated: "They made a choice in one district." "So let's not get yourself carried away as an expert on demographics and the rest of that within the caucus or outside the caucus." Every one of you fascist GOP TH UGS will be killed after the revolution. If all GOP voters are fascist thugs… aren't we oversimplifying there? ANTI-FA is a Self-admitted Radical Socialist Group. National Socialism (aka NAZI) was a Radical Socialist Group applying the same tactics of disruption and fake media use that we are seeing today. Radical Socialism has a track record of MASS MURDER once in power. Plus a history of political purges resulting in the elimination of between 26% to 32+% of its own local followers that have gained too much political power. Power that the "New" leadership wants centralized for themselves. i hope that the animal rights folks pay you a visit in the wee hours so we can hear YOU squeal. i agree with " F*CK ISRAEL " . BushCo and JEWS did 9/11. Lmao, when you're edgy enough to want to end borders and law but you're not edgy enough to curse.